I've been on the Tsu social network since it started in late 2014. Their main feature was that you get paid based on the views you get for your content. Their concept was that those creating original content (artists, photographers. writers, musicians) should get rewarded for their work. That content could be shared from other sites (e.g. Youtube) so that you would earn on Tsu as well as any income you got elsewhere. People have asked if Tsu could host video themselves. I expect there are some issues with that in cost of hosting, as well as ensuring it does not breach copyright, but some new video functionality is coming in May. To promote this they have launched a contest for original music. Musicians can submit a track (linking to it on Youtube, Soundcloud etc) and if selected to progress should create a short video (up to three and half minutes). Songs will be judged in 6 categories with winners getting $1000 and then play off for a grand prize of an additional $8000. I assume that videos will use the new features. They are obviously hoping to recruit more musicians to use Tsu to promote their music. I know that some on the site have done very well from it by bringing in their fans. There's an incentive to recruit musicians as those who invited the winners of the categories will also receive $1000. It's tough to be a musicians, so any extra income should be welcome. Help to bring musicians to Tsu and they could benefit and you will too through their network scheme that passes a share of income to the 'parent'. Once you have joined you can use the Invite button. I've only written a few original songs, but I'm tempted to submit one. It's been a while since I updated this blog. There just never seems to be enough time. I'm trying to play as much guitar as I can. That includes a weekly acoustic session and a monthly open mic at the local pub. That gets me playing, but I need to find time to work on songs in between. The big news is that I finally had a custom guitar built by Steve Benford. It's a modified Telecaster with a few special features. I'm really enjoying it and it was a pleasure working with Steve even though it was all via email. I cover some of the details of this guitar in my latest podcast. It's taken me about a year to get around to episode 3, but I wanted to keep it going and will try to do more this year. This episode includes the latest song I wrote. I'm hoping some friends will contribute so it's not just me rambling on. I intend to continue with writing songs. I have a few ideas I need to work on. 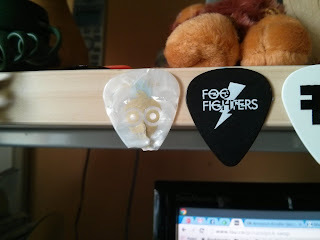 A while back I noticed that I had a lot of guitar plectrums around the place. I only use a few of them, but they do look nice, so I have stuck them along my shelf above the desk. There's about 30 of them now. This latest piece was contributed by someone at the acoustic session. The Foo Fighters ones came as a set bought at the Milton Keynes gig last year. I've started a group on Tsu for people to swap picks. It's yet to really take off. I have offered to send people money from my Tsu bank to cover their costs and will also donate to charity. I have built up a fair bit there and want to make use of it. I've also been doing a little bit of guitar repair on behalf of a friend who runs a charity shop. Some of the guitars that get donated need a bit of work. It's fairly basic stuff like stringing them up, replacing bridges and tuner buttons. All useful experience.